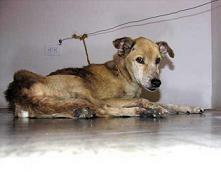 Save Dogs from Dying for "Art"
- In the 2007, the 'artist' Guillermo Vargas Habacuc, took a dog from the street, he tied him to a rope in an art gallery, starving him to death. For several days, the 'artist' and the visitors of the exhibition have watched emotionless the shameful 'masterpiece' based on the dog's agony, until eventually he died. Does it look like art to you?